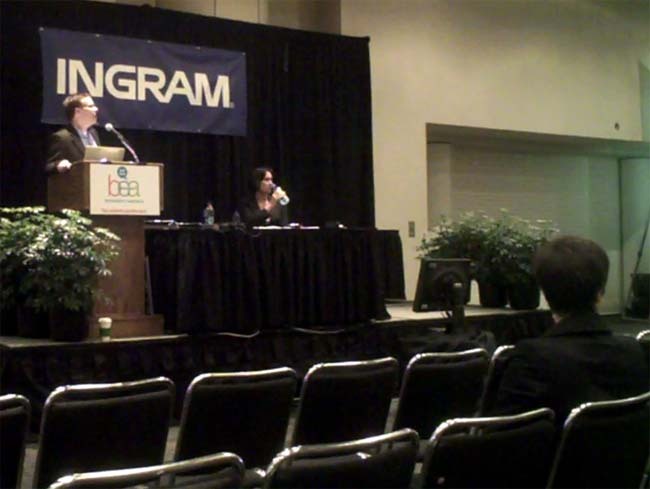 At BookExpo America, helpful data is presented on ebooks. Now if only we can all agree on what a “power buyer” is. The E-Book Era is Now: What Does It Look Like From the Consumer Perspective? And What Do We Do About It? On Monday morning, approximately one hundred besuited souls assembled in a large conference room without a single distinguishing architectural feature. Like much of the Jacob K. Javits Convention Center, it was an ideal place to commit suicide if you were having second thoughts. But the occasion on Monday morning was slightly cheerier. After Angela Bole, an executive director at the Book Industry Study Group announced, “Shrinkage is not an option,” leaving me to wonder whether there was some detumescent publishing commodity comparable to cold water, a man with a speaking style somewhere between a regular guy and one of those obnoxious autistic types who fly in from Mountain View and walk into a room as if they own the place prepared to discuss a “most unique” [sic] situation. Kelly Gallagher, a vice president at R.R. Bowker, delivered a presentation called “The E-Book Era is Now.” I didn’t realize you could call a two year period an “era,” but I was curious to learn how this “looked like from the consumer perspective.” I also wondered if Harry Selfridge’s maxim was applicable in the Internet age. Was the customer right? Or were much of the players full of hot air? As it turned out, it was a little of both. What the hell was a power buyer? Well, as our somewhat suspicious friend from RR Bowker informed us, it was a catch-all term not unlike “artificial sweetener.” You could call a power buyer (as Gallagher did) a 44-year-old woman who made $77,000 a year who sits on a beach buying predominantly fiction (mostly romance). Or you could settle for a more general idea: the power buyer as someone who purchases an e-book every week. As a Powerpoint slide later revealed, that definition wasn’t entirely right either. I was told that, in March 2011, about 18% of power buyers acquired ebooks weekly, that about 52% purchased ebooks once or twice a month, and that about 28% “rarely/sporadically buy.” I suppose that if you fall into that latter category, everybody with a portable reading device can be called a “power buyer.” So if you happen to own an e-reader, feel free to shout “I’m a power buyer!” just after the Romans nail you to the cross. Either that or someone in the Bowker office had that catchy Snap! song on repeat. When Gallagher opened his presentation with an awkward metaphor about the blue people from Avatar, it was clear that he hadn’t quite studied the film’s imperialistic message – even if he did close with a slide suggesting a sunny if somewhat backhanded multiculturalism. But he did offer some information about the state of ebooks that was helpful for today’s digital movers and shakers. “That’s what we call the hockey stick,” said Gallagher as he presented a line plotted by rising percentage points with a noticeable dive last month. In April 2011, ebooks had fallen to about 11% of the market. This was the first dip that ebooks had seen and the closest thing this Gallagher had to a Sledge-O-Matic. But Gallagher was careful to suggest that this had more to do with “fluctuations” of a nebulous nature. “The e-buyer today is really moving the market,” said Gallagher. But he didn’t quite say how. He did note that “power buyers” were very dedicated to their personal devices and had largely abandoned their PCs. And the power buyer, whether a 44-year-old woman or a guy wearing nothing but his underwear in a dark room compulsively hitting a one click button, was different from the core e-textbook buyer, who is a 23-year-old male grad student (or distance learner) who was more likely to pirate than underclassmen and who purchased 17% of his textbooks in “e.” (Wild stab in the dark, but I’m guessing that Gallagher didn’t attend a lot of raves back in the day.) This textbook buyer, whoever she may be, does not have a clear sense of download. Unlike ebooks, there are certain barriers with e-textbooks — namely the fact that e-textbooks cannot compete with physical textbooks — that prevent the e-textbook from growing. It wasn’t a surprise to learn that the laptop (51%) and the desktop (20%) reflect the top shares of the e-textbook market, with dedicated devices not really fitting the bill. Students want highlighting, note taking, and searchability. But the e-textbook market isn’t giving it to them. 75% of students still want the physical textbook. But on the trade front, Kindle is the dominant source, still growing in market share. It is estimated that Kindle reflects about 65% of the ebook market. Dedicated e-readers have replaced the PC, which was once the #1 device for the ebook market in 2009. Gallagher brought up “digital fatigue” as one explanation for the poor performance of e-textbooks. “They are continually wired in their lives,” he said. “Many are indicating they just don’t want to go there with books.” On the other hand, another slide informed the audience that it was “too early to tell” about the effect that digital fatigue is having. While some “power buyers” were still buying print books, the numbers suggested that 45% of “power buyers” were buying a decreased number of hardcovers and 50% were buying a decreased number of paperbacks. If this sounds gloomy for print acolytes, the other side of the coin is that ebooks have greatly helped to expand the total market. Gallagher didn’t have specific numbers or dollar figures on this front to offer. I presume that one will have to cough up the dough to buy his report. But near his conclusion, he did say, “We need to understand which part of the market we’re really talking about. Are we focusing on the right power buyer?” That’s a good question. But if a “power buyer” is such a plastic idea, shouldn’t the ebook industry focus on solidifying that before talking about “focus?” Especially when it comes from a guy who claimed that authors can “manage their own destiny” online. While Gallagher’s data was mostly useful, I felt at times that the audience was collectively reading a Choose Your Own Adventure novel rather than seriously considering the future of publishing.